There are many books on randomness. Most of them explore the very frequent random events occurring around us; that randomness is actually the norm in nature instead of the determinism and causality human beings seek. Random walk is a scientific term describing the movement of atoms in fluid. In fact, such phenomenon should be more accurately termed drunkard's walk. The atom is moving in a path until it strikes another atom and changes course. The event of meeting another atom is random. It is like a drunkard who may think he is walking straight until he runs into someone or an obstacle which changes his direction. However, the book is not about scientific phenomenon. It is about the fact that randomness rules our lives. There are illusions in life that we think events happened for a reason while they are not. Chance plays a very significant part in the unfolding of the future. We need to be clear about this fact and to develop the right attitude to deal with it. A major part of the book is devoted to the history of the science of statistics: how it is developed slowly and for what reasons. It helps build respect for this discipline of science and caution on the abuse of its use. On numbers such as quantity, distance, size, etc, humans live within a very narrow range. We are only comfortable with numbers we can observe in our daily live. Very large numbers and very small numbers were mysterious some centuries ago. Their explanation could only be given in theological term. As science developed, many people were not comfortable with this belief. They realized their limitation even in performing simple measurement. The result was a revelation that there are errors in everything. This conclusion spurred the development of the law of errors, where errors were duly acknowledged and respected. The first formal presentation of errors is the standard deviation in scientific measurements. Gambling is a human trait which separates us from other living things. Gamble is a game we play for fun since many centuries ago, accepting chance as the rule of the game. Very often it led to superstitious behaviour which is still seen today. All along, some people gambled for a living. Eventually there were conscious studies of the secret of winning the game. The law of probability was developed from long term observation of the results of dice rolling and roulette turning. Someone managed to make a fortune in spotting the abnormality of chance owing to defected dices and roulette wheels. The method of probability eventually grew into the law of normal distribution and the Bell Curve. The author explains in great length the human nature which tends to seeing chance as causality. Long term observation of a phenomenon will sometimes lead to clustering of results. They may be interpreted as positive results but they could actually be false positives occurring by chance. Human mind has a confirmation bias. We preferentially seek evidence to confirm our preconceived notions, and we interpret ambiguous evidence in favour of our ideas. Our brains seek patterns in everything we see and interpret them as order, while many patterns could just occur by chance. 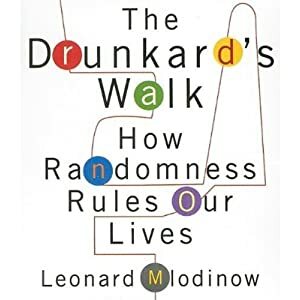 The conclusion of the book is that we need to realize how randomness rules our lives. The determinism, fate and causality we believe may just be the result of chance. The drunkard's walk has a special meaning other than its scientific definition. We may be walking a path we wrongly believe as the definite way, but we may be the drunkards under the influence of alcohol. Our lives will change course at every random event. The best way to deal with it is the realization of the role of randomness and chance in our lives, and be prepared to distinguish between patterns and results happened by chance and those occurred for a reason.